CURB said, “On May 16th Opposition Leader, Mr. David Burt, gave a speech on Bermuda’s social issues to the Hamilton Rotary Club and spoke about the Two Bermudas; the economic divide, ongoing income inequality, and the divisions that are present in our community. “The speech resonates with CURB’s mission and philosophy around the need to address the divisions around race, and the urgent need to address the increasing polarization between those with wealth and the unemployed and impoverished; with this division predominantly along racial lines largely built on the back of generational inequities of a system built off the back of slavery and segregation. “There is a great need to address matters of racial justice and the need for change. James Baldwin, one of the 20th century’s greatest writers, said “You cannot Fix what you will not Face.” His groundbreaking literary work on the exploration of racial and social issues is today as important and as relevant as it was in the middle of the 20th century. “To address these issues head on resonates with Baldwin’s adage. As a society we must be willing to face the truth of our past and its ongoing resultant inequalities. This work must be done not only at an individual level, but at a systemic level across political, economic, business, cultural, social and community organizations. “The lack of numbers at the luncheon clearly indicates there were those who chose not to attend the presentation, an organization that is supposed to put “service above self.” The action taken by those members gives implicit support to the structural racism policies that gave rise to the Two Bermudas, and by default makes their stance far more political than the actual speech, which focused on social issues, collaboration and community. “This action goes against Rotary International’s stance that Rotarians be involved in their communities, be civic-minded, and engaged in public improvement; and to keep under review political developments in their own communities and to seek reliable information through balanced programs and discussion so that members can reach their own conclusions. “We hope the Hamilton Rotary Club will be inspired to follow the lead of the Bank of Bermuda Foundation, which has taken steps through their “Theory of Change” to tackle the conditions that gave rise to the Two Bermudas. CURB welcomes the Foundation’s foresight and willingness to lead on this front. “Race continues to be a strong force in determining how opportunity is distributed in Bermudian society. It influences important decisions made in people’s personal, professional and social lives, including how we vote, what social programs we volunteer for, what cultural events we attend, and who we hire. “We also recognize the subtle forces of racism. We view the America’s Cup Restricted Marketing Order, 2017, while protecting the rights and brands of participants and sponsors of AC35, as restricting the rights of less-well-off Bermudians in particular. A common practice of legally selling goods on the streets has been curtailed by this Order, save for Bermuda Day. “An event which has been billed as one that will benefit all of Bermuda now restricts those most in need. To avoid the appearance of economic and cultural apartheid, we call on the Government to immediately restore the street-selling rights of ordinary Bermudians outside of America’s Cup Village. “By talking about race we have the opportunity to explore, examine and challenge these attitudes. 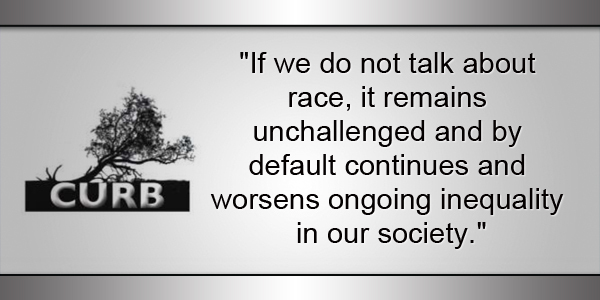 If we do not talk about race, it remains unchallenged and by default continues and worsens ongoing inequality in our society. “I want to make it very clear that any existing street stand or road side vendor is not affected by this order, and that anyone wishing to set up a new stand inside of the restricted zone, subject to permission from the appropriate Government entities, can ask the ACEA to agree,” Mr Winfield said. Not suprising CURB uses alternative facts to push their agenda. No different than them using fake census immigration statistics in 2016 to justify their anti-immigrant Trumpesque stance. Do you think CURB will apologize for spreading this misinformation? To be frank I have not met an organization that is more racially biased or who fans the flames of racism hotter than CURB – except, perhaps, the PLP when they are trying to win an election. When I hear CURB I tune out. I think I’ve actually become more racist due to the efforts of CURB because they have caused me to simply stop caring. You have become MORE racist, that implies that you were already a racist. No, not true. I agree that CURB has brought out racism where it had not been before. CURB has done more damage than good. I see this with my own eyes. Perhaps they started out with good intentions but I now tune it out as well because all I see from them is hatred. I’ve even learned from CURB that there is such a thing as black on black racism. I did not know that. Thanks CURB. Onion Juice – we are all, to some degree, racist. That is why there are things like China Town in Toronto and New York. That is why there are ‘black’ neighbourhoods and ‘white’ neighbourhoods. The question, for educated individuals, is whether they have preconceived notions about somebody because of their race, and, if they do, if they can overcome them. So yes, call me racist. Point is that CURB contributed to increasing my level of racism rather than their stated goal of CURBING it. And here’s CURB to make sure this becomes racial. Well did you not hear about de Black sailing team that wanted to participate in de Americas Cup and were denied and after threatened to be sued settled out of court. We ALL know its a sport for de elite and ya trying to down play it. They met none of the requirements and didn’t properly enter/pay the deposits. It had nothing to do with their race. So why did they have an out off court settlement? Yes, the team that admitted they didn’t have the financial backing as the other teams but was insipired by Cool Runnings. That was a dispute between Golden Gate Yacht Club and African Diaspora Maritime Corporation with a breach of contract (not about racial discrimination), not Oracle or the actual America’s Cup team. African Diaspora Maritime Corporation had every opportunity if it wished to particpate in the Bermuda event…don’t recall them submitting their bid. So how is that relevant to us, now? Yep, and armed with misinformation as always. Never let facts get in the way of making a point! I have no time whatsoever for CURB. They have lost all their gravitas. New political party? or just another wing of an exhisting one. CURB does not have credibility here. The main point here is that CURB got it wrong. Two Bermudas? We are lucky. I’ve visited many places where there people live in shacks and shanty towns. Hence the term ‘third-world’…we are fortunate to have just two. So what countries are second world. And here is CURB with its predicable drivel that amounts to nothing more than virtue signalling at its worst. Shame really. In every democratic and capitalist country, there are really wealthy people and not wealthy people and lots of variances in between. CURB seem to be pushing communism at worst or socialism at best – sorry but I am not interested. CURB has zero credibility and refuses to accept that and even pretend to make an effort at really bringing people together. From the support of a minimum wage to promoting the Irritated Jeanie – CURB are part of the problem – not the solution. How does a racist organization able to justify or maintain charity status? Why haven’t the Human Rights Commission stepped in and brought these to answer for their inflammatory deeds? That assumes that all those who did not attend are white. I do not think that is a safe assumption. It is not all differences as some profess and there is a lot of commonality that exists between the two Bermuda’s. CURB or David Burt do not always recognize this strength in our community. The things we have in common – rather than the differences – should be the first and most obvious tools for fixing what we face. I am still waiting for CURB to address the rampant racial equality in the upper ranks of the Civil Service. It would appear that essential criteria for the top posts, with their six figure salaries, are to be a graduate of The Berkeley Institute and look like Dr Brown. Of course, this doesn’t fit CURB’s narrative nor their very blinkered view of Bermudian society. CURB a complete utterly ridiculous bunch. aligned with any particular party that drivels the same s***? I don’t waste my time with them anymore. There is no racial injustice in our modern age. Name me one example. That does not exist in your imagination, and that does not require exaggeration. Exactly. Forget about the “…the subtle forces of racism…” Please point out to the people of Bermuda the clear, easy to show examples of racism before we even begin to talk about subtle, vague, not totally sure of but it must exist examples. I am seeking answers as discrimination based on race is ILLEGAL in Bermuda and (assuming) every democratic country the civilized world….It is so easy to blame the forces of racism for every single inequity in this island, but when pressed CURB and other virtue signallers will be unable to point out one single example…Name one law, one policy, one rule that is racist…..Total nonsense and CURB only exisits to make these virtue signalling social justice warriors feel good about themselves…. Like the luncheon clan, all the comments on this thread, concisely proves Curb’s point. Campaign Upholding Racial Bias. Keeping Bermuda divided !